PROMAG Saiga 12 Gauge 10RD Magazine, Black Polymer (SAI-02) - "8-pack"
This is a "8-pack" of 10-round magazine for the Saiga-12 shotgun by Promag Industries, Inc.
therefore, accordingly marked "Made In The USA". This the latest release of the magazines, they are extremely rigid and durable in the harshest conditions. Covered by a Lifetime warranty directly from the manufacturer. Note: Verify the laws with your local authorities before ordering!!! 1. By purchasing and requesting these magazines to be shipped, you are stating that it is 100% legal for you to RECEIVE & OWN them! Please check your local state laws! 2. By purchasing these magazines you certify that you are making this purchase for lawful purposes only and you will not supply them to other parties in violation of federal & local laws where applicable. 3. Please, do not ask for anything you know is against the law in your state. 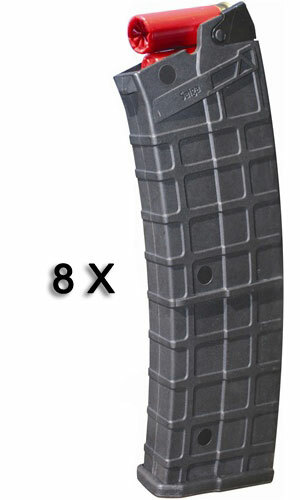 Saiga-12 10-round Magazine GEN3 (AGP) - "8-pack"
SGM Tactical Saiga 12 Gauge 10RD Magazine, Polymer Black - "8-pack"